Clara Ruby Lynch, age 90 of Corbin, Ky. passed away Thursday January 31, 2019 at The Heritage in Corbin, Ky. She was born June 11, 1928 in Columbus, Mississippi to the late Lonnie and Annie Adams Langford. Along with her parents she was preceded in death by 7 sisters and 5 brothers. Ruby loved her family and loved playing bingo at the VFW. She was a wonderful friend, wife, mother, grandmother and great grandmother. 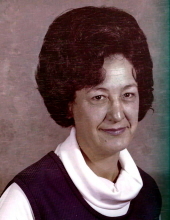 Ruby was a life member of the Lady’s Auxillary post 3167 in Williamsburg, Ky.
She is survived by her husband Ermon Glenn Lynch of Corbin, KY., Daughter Bobbie Jean (Don) Mays of Michigan City, IN., Step Son Gerry Glenn Lynch of Clearfield, Utah., 3 Grandchildren Sheila (Jay) Ulku of Jefferson City, TN., Sheryl Eaton and Charles Eaton of Michigan City, IN., 4 Great Grandchildren. Stacey Smolinski, Stephanie Harvey of Fargo, ND. Brandy Eaton and Shaun Eaton of Michigan City, IN., a brother William “Titem” Langford of Columbus, MS. lots of nieces, nephews, and a host of other relatives and friends to mourn her passing. Funeral service will be 2:00 PM Sunday February 3, 2019 at Ellison Funeral Home Chapel with Rev. Doyle Lester officiating. Interment will be in the Highland Park Cemetery Davis Addition. Visitation will be 6:00 PM Saturday February 2, 2019 at Ellison Funeral Home. To send flowers or a remembrance gift to the family of Clara Ruby Lynch, please visit our Tribute Store. "Email Address" would like to share the life celebration of Clara Ruby Lynch. Click on the "link" to go to share a favorite memory or leave a condolence message for the family.